Once again this fall, I’ve been kept busy meeting the food demands of the hordes of birds that have descended upon my yard and feeders. At least two dozen white-throated sparrows have been gorging themselves on the millet finch mix I scatter on the ground. These small seeds have also attracted white-crowned sparrows, dark-eyed juncos and three beautiful fox sparrows. Black oil sunflower aficionados like blue jays, house finches, cardinals, chickadees, white-breasted nuthatches and American goldfinches are also putting a serious dent in my birdseed budget. Not to be outdone, hairy and downy woodpeckers have been on a non-stop crusade to empty the peanut feeder. Clearly, October is a wonderful month for feeding birds. But, despite our best attempts to entice them to stay, migrants such as white-throated sparrows abandon our yards in late October for wintering grounds in the southeastern U.S. By early November, there is often a marked decrease in feeder activity. Most years, however, a second wave of visitors eventually fills the void. These are the so-called “winter finches”, a term used to describe highly nomadic species like redpolls, siskins, purple finches and pine grosbeaks, all of which belong to the Fringillidae family. Some winters, they are totally absent from the Kawarthas, while other years they can eat you out of house and home. Last year, big flocks of pine siskins and purple finches were a constant presence at local feeders Why is it that finch numbers fluctuate so widely? The short answer is the availability of wild food. Winter finches move southward – or east or west – when there is a shortage of food in their breeding territories in the boreal forest of northern Ontario and Quebec. The wild foods the birds depend upon most are the seeds and berries of deciduous and coniferous trees such as birches, mountain-ashes, pines and spruces. If seed crops are good in the north, the birds stay put. If food is lacking, they will sometimes fly thousands of kilometres to find it. Whether they actually choose to spend the winter here in the Kawarthas depends on the abundance of wild food crops in this region. Since the fall of 1999, Ron Pittaway of the Ontario Field Ornithologists has prepared an annual forecast of what winter finch species are most likely to show up in southern and central Ontario over the upcoming fall and winter. The forecast is based on the relative abundance of seed crops in the boreal forest. Much of the data comes from Ministry of Natural Resources staff. So, what is the seed crop situation this year and what are the implications for the thousands of area residents who enjoy feeding the birds? Below you will find a species-by-species breakdown. 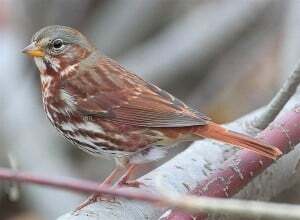 Although not finches, four other bird species are included in the list, namely the blue jay, red-breasted nuthatch, bohemian waxwing and American robin. PINE GROSBEAK: This, our largest finch, will probably stay in the north, because native mountain-ash berry crops are good to bumper across the boreal forest. If some grosbeaks do wander south into the Kawarthas, they will search out European mountain-ash berries and ornamental crabapples. They will occasionally come to feeders, too, if sunflower seeds are available. PURPLE FINCH: Purple finches have been moving south since late August, when small numbers were appearing daily at my feeder. The southward flight is due to poor seed crops on deciduous trees in the north. An easy way to tell purple finches from house finches is by checking the tip of the tail; the former has a distinctly notched or slightly forked tail. The house finch’s tail is squared off. Both species prefer black oil sunflower seeds at feeders. 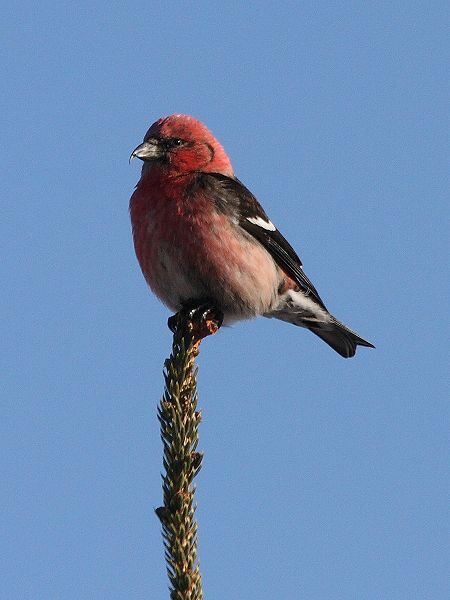 RED CROSSBILL: Expect a scattering of red crossbills in central Ontario this winter. Listen and watch for them on spruces and pines, including large-coned ornamental pines. Petroglyphs Provincial Park is often a good place to see these birds. WHITE-WINGED CROSSBILL: This crossbill moves back and forth like a pendulum across the boreal forest looking for bumper spruce cone crops. It ventures south only in years of widespread cone crop failures. We can expect some white-winged crossbills; however, abundant cone crops in the north will probably keep them at home. Both crossbill species increasingly use feeders with black oil sunflower seeds when conifer seeds are scarce. PINE SISKIN: This is another species that depends on the seeds they extract from spruce cones. Since the cone crop is generally poor in the boreal forest of Quebec, we can expect some siskins to move south into central Ontario this winter. Most, however, are probably making a beeline to northern Ontario where abundant food awaits them. At feeders, siskins prefer nyger seeds in silo feeders. COMMON REDPOLL: Given that birch seed crops are generally poor in the north, redpolls should move south this year and grace local feeders. Like siskins, they prefer nyger seeds. 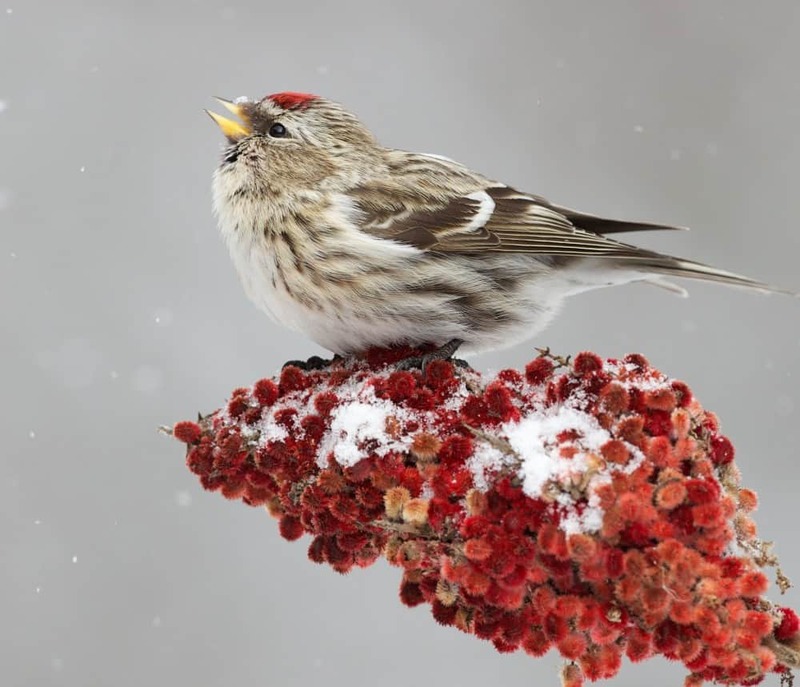 Hoary redpolls, which are paler and larger, are often mixed in with flocks of common redpolls. EVENING GROSBEAK: Breeding populations of this spectacular finch continue to increase in Ontario and Quebec. This is due to increased outbreaks of spruce budworm, a staple food for nestlings. It is likely that some evening grosbeaks will show up feeders in the Kawarthas, like the pair that paid me an unexpected visit in mid-September. Like so many other winter finches, evening grosbeaks prefer black oil sunflower seeds. If you want to travel a little further afield, the feeders at the Visitor Centre in Algonquin Park usually have grosbeaks in winter. The abundance of other birds – albeit not finches – also varies greatly from one year to the next. Once again, numbers depend on the availability of wild food. BLUE JAY: The number of jays that tough it out in Ontario in a given winter is linked to the acorn, beechnut and hazelnut crop. Acorn production was good in many parts of central Ontario and the Kawarthas this year, although the drought damaged some of the crop. It is likely that good numbers of blue jays will hang around this winter. RED-BREASTED NUTHATCH: A southward movement of these small, hyperactive birds is underway right now and is evidence of poor cone crops in northern Quebec. It is unclear whether these nuthatches will show up in the Kawarthas in above-average numbers. 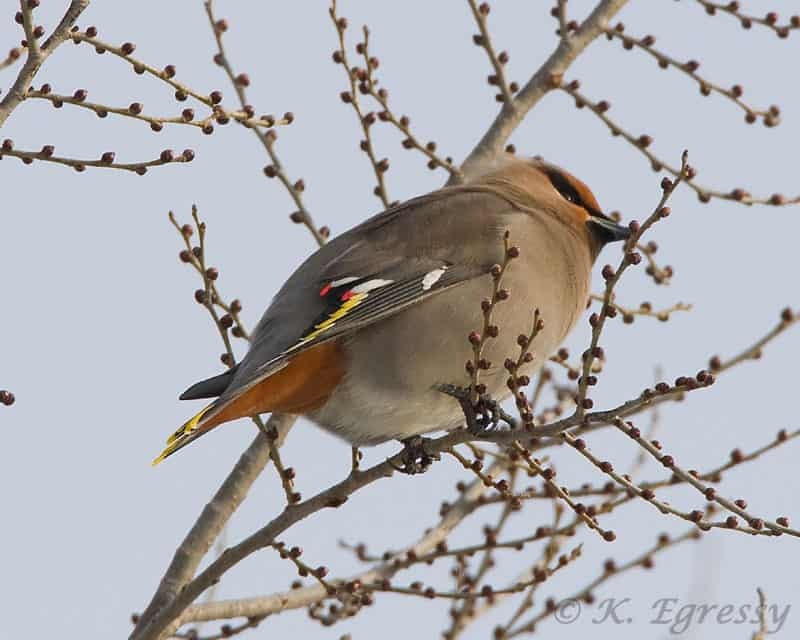 BOHEMIAN WAXWING: Most bohemians will likely remain on their breeding grounds in northern Ontario and western Canada this winter, given that native mountain-ash berry crops are good to bumper across the boreal forest. Most years, however, at least some bohemians show up in the Kawarthas, possibly due to reliable annual crops of European buckthorn berries. If they venture south, bohemians are also attracted to European mountain-ash and ornamental crab apples. 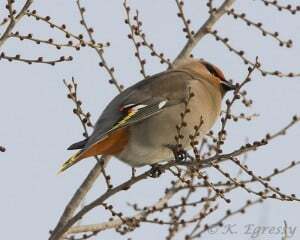 They can be distinguished from cedar waxwings by their rufous undertail feathers, yellow tips on wing feathers and dark grey belly. AMERICAN ROBIN: Given the abundant fruit on wild grape vines this year in the Kawarthas, it is likely that larger-than-average numbers of robins will spend the winter with us. Flocks can often be seen along the Trans-Canada Trail west of Jackson Park and along the Parkway Trail between Hilliard and Cumberland streets. The best way to attract robins to your yard in winter is by planting wild grape, European mountain-ash and ornamental crab apples. Robins may also come to a heated winter birdbath and to offerings of raisins and apple halves. To conclude, it looks like a variety of winter finches and other birds could show up at your feeder this fall and winter. These predictions are not yet an exact science, however, so we’ll have to wait and see. To get up-to-date information on what birds are turning up in the Kawarthas, go to ebird.org, click on “Explore Data” and then “Bar Charts”. Choose “Ontario”, followed by “Counties in Ontario” and then “Peterborough”. Set the “range of years” for the current year only. And, If you haven’t done so already, get out your feeders and stock up on black oil sunflower, nyger and millet seeds. The birds will thank you for it and you’ll have non-stop backyard entertainment! 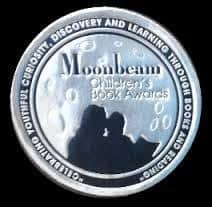 The recently-published “Big Book of Nature Activities”, which I co-authored with Jacob Rodenburg, has won a silver medal in the North America-wide 2016 Moonbeam Children’s Book Awards. The book was entered in the category “Activity Books: Educational, Science and History” Each year’s entries are judged by expert panels of youth educators, librarians, booksellers, and book reviewers of all ages. “The Big Book of Nature Activities” is available at Happenstance Books and Yarns in Lakefield, Avant-Garden Shop and Chapters in Peterborough, and from online booksellers.